With help from volunteers from Yell and St Lawrence's Church the 31st July saw the garden transformed. 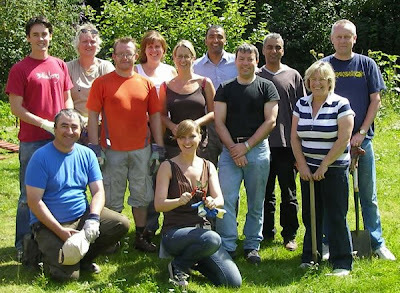 Volunteers dug up beds and an allotment that can now be used and cleared up paths that were barely visible. 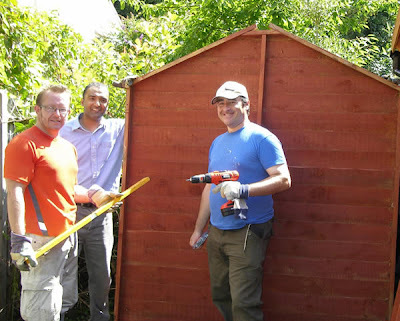 For the compost toilet the area behind the shelter had to be cleared, the donated shed given a coat of timber preserver, the ground levelled and cleared, blocks laid as a foundation and finally the shed was assembled. The toilet itself will be finished at a later date. 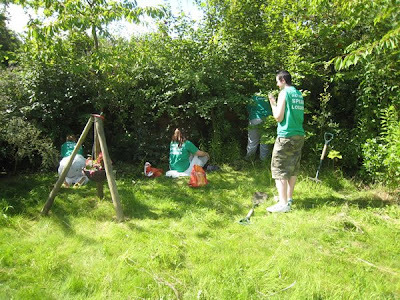 The volunteers did a magnificent job in the hot weather, some areas have been transformed. They, and other groups or individuals, are welcome to help our community garden in the future. Please see our website at www.orcg.co.uk for information on what is happening and for contact details. We're in this week's Reading Chronicle, where I discuss the green benefits or using what others consider a waste product to give nutrients to the soil. Also it will be more convenient for gardeners than going to the fast food outlet next door.